We've been busy around here as we continue to try and fill our winter days and stay healthy at the same time. We went to a Silly Safari's event a while back, but I never posted a picture. 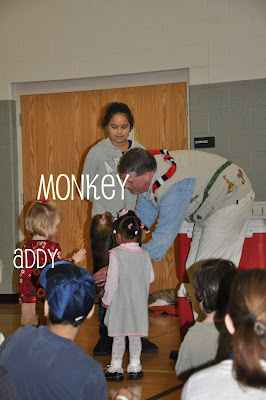 The girls were skeptical at first, but when Safari Dan asked for volunteers to pet a monkey, Addy didn't wait for her name to be called, she just walked up and joined the 2 kids he did call on. Her face when he told her that his monkey ate gummy bears was priceless. Jeremy and I were convinced she'd eat the gummy before ever feeding the monkey, but she held onto it and fed on cue. 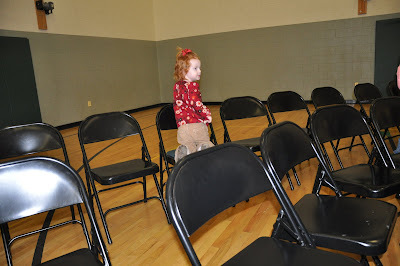 Lilly rearranged all the chairs in the back of the gym before announcing loud enough for everyone to hear that it was time to go. We went swimming the same weekend at an indoor pool and Lilly loved every minute while Addy sat outside the pool, teeth chattering, playing with the plastic toys. At 2 1/2, they are already opinionated about how to spend their social time. 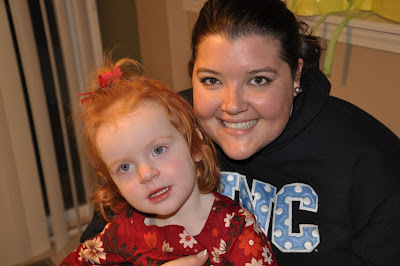 Jenny came to visit from NC and the girls like having visitors as much as I do! We spend a lot of time reading as our bedtime routine sometimes lasts an hour. 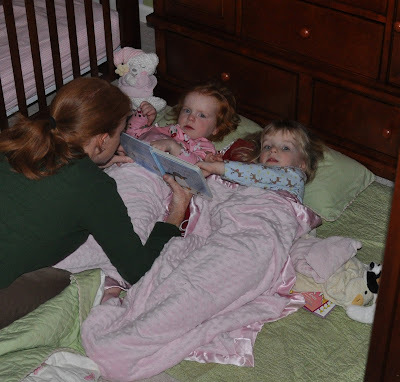 This particular night they wanted nothing to do with their beds and built themselves a nest on the floor. We are learning to pick our battles as far as bedtime/naptime is concerned. Yes, Aunt Cat, 2 more weeks of jersey-wearing! Let's go Colts! Well, we love you unless Mommy's in the house, then we love her and we want her to dress us, feed us, bathe us, brush our teeth, read to us, etc. It has gotten a bit out of control around here with "MOMMY do it", "Go away Daddy" and total meltdowns all common occurrences. They sense I'm a total sucker and I end up coming to the rescue just to avoid the tears that are inevitable. Must get thicker skin. Must get thicker skin. Must get thicker skin. Bedtime sagas continue, they gave up around 9 tonight. Lilly has taken to sleeping in her "big girl" bed turned around against the wall, so she can't get out and best of all-Addy can't get in. She literally asks to be covered OVER her head and tries to sleep while Addy sometimes takes 2 hours to 'come down' from the day and fall asleep, more often than not, on the floor in a giant nest of blankets and pillows she has made for herself. The yelling/screaming/tantrums have stopped, but my ugly-mom personality rears its face most nights. On a positive note, we had successes on the potty tonight and its small victories like that which prove to me that they are listening and we are making progress, just progress on their timetables, not mine. 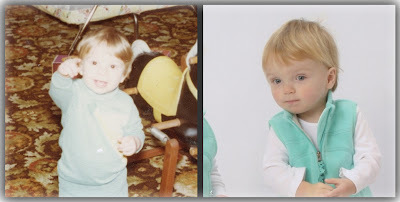 Jeremy & Addy's comparable shots, around 15 months...whaddya think??? Everywhere we go, I continually hear "That's so cool, one twin looks like you and one like her daddy?" 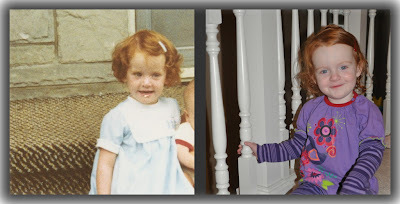 I think they are a good mix of each of us, but my mom recently dug this shot out of me about the same age that Lilly is now (and a picture of Lilly taken this morning), and I'll let you guys decide.... 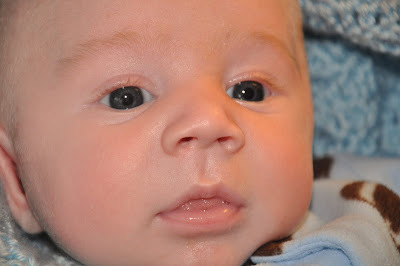 Challenge to Jeremy's mom, see if you can find a 2 1/2 year shot of Jeremy and we'll compare! It continues to be rough times around here as we've battled stomach bugs and colds for a couple weeks now. All I can say, is thank God for grandparents! All four grandparents have helped us tremendously over the last couple weeks and I'm not sure we would have survived without them (and Jeremy certainly wouldn't have made it to that Colts game). Thank you! As turbulent as things have been around here, between lack of sleep because of the bed situation, a stomach bug (times 2) and one crabby mommy, last week brought a welcomed change to our routine. 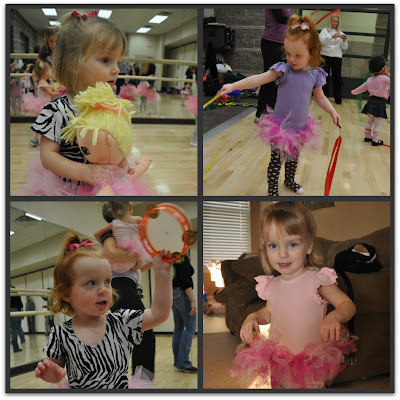 We began our first dance class. 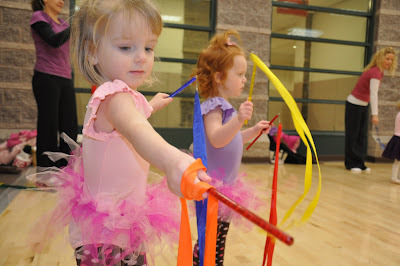 I took dance lessons most of my life despite never getting to be very good at it. I have wonderful memories of my dad bringing me flowers for my recitals and I absolutely loved the costumes. It's a great way to burn off some energy, proven today by the FIRST nap in toddler beds without a fight! Hooray! 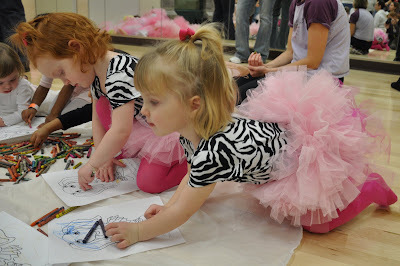 The class has story time, coloring time and dance time, each week themed around things like rainbows, fairies and princesses. It's a 2-year-old dream and I had a blast too. I've been pretty honest in the past about our struggles with naps and bedtimes. It has always been a hurdle for us. After Addy started climbing out of her crib a couple months ago, we used the crib tents to delay the inevitable, but it was only a few days before she figured out how to get herself out of jail free and we were back where we started. The tent alone was a deterrent and it bought us a little time to get through the holidays. We wanted to work on the nighttime tantrums before we moved into big-kid beds, thinking if we could get them under control, the transition would go smoother. Lilly was the trouble-maker, sometimes screaming for 20-30 minutes at bedtime and NOTHING worked. I finally decided that they might be ready for some long-term incentives, so we introduced the sticker chart. I downloaded from here, and they earned a sticker when they went to bed with no noise and no trouble. When the sticker chart was full, they earned a special adventure with Daddy. Lilly caught on quick and earned her special adventure first, Addy took a little longer, but did okay. We wanted the special adventure to be geared to them specifically. Lilly has a longer attention span that Addy does at the moment and LOVES her cartoons, so we settled on "The Princess and the Frog" movie matinee for her and daddy. Jeremy said she enjoyed the experience, thought it was pretty cool, ate a lot of snacks and wanted to leave after 45 minutes. 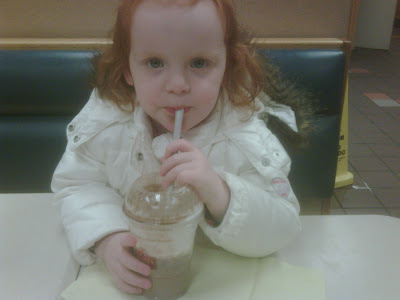 They ended up at Wendy's with a chocolate milkshake in hand, and she came home beaming. She truly is a daddy's girl. Addy's our mover and shaker, so Jeremy quickly decided that a local "fun zone" was the best place to take her to run off some steam. She had a blast (Dad did too) and they ended up at Dairy Queen eating too much ice cream. During each special adventure, the other daughter stayed home with me and I thought there would be a lot of whining, but they totally understood. They knew they each had a turn and were great. When we felt we had control of the bedtime transitions, we threw a big change at them and converted their beds to toddler beds. To say the transition has been hard would be an understatement and I'll write more about our obstacles in a later blog. At this point, just send us sleepy thoughts as we try and get our toddlers on some kind of sleep schedule that works.